My parents are decorators, and are very talented. I try to ply them for tips when they're here, but they're also sensitive about this being "our" house and don't want to impose. To that, I say PSHAW! So, here's the deal. We have this great big window at the stair landing, and it's pretty awesome. It would be even more awesome if it were 100% weather tight (it gets a little drafty in the winter right now) and if it didn't look at my neighbor's ever-more-decrepit house. This has been an ongoing battle. We're in detente right now, but look for things to pick up this spring as the weather improves and we have more sightings of our neighbor in only her housecoat picking up leaves in her yard on windy days. Not cool. So, we're looking for a window covering. Something that we can pull closed during winter months to avoid drafts, something that will frame the giganticness of it all, and something that will soften up the rather stark wood (which we're going to replace and paint off-white, but will still need something to lighten the mood). So, Mom, I know I've been rather impossible to work with here, as I have something pretty specific in my head, but can't translate it into words. I looked at about a trillion fabric patterns, and here are just a couple examples that caught my eye, both in terms of print and colors. They all have birds on them--this doesn't mean I need birds in the fabric we go with, but I've been thinking about birds, and I like the shapes, so just consider them inspiration. 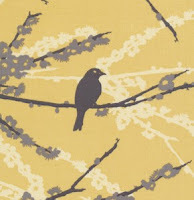 This one: You know I'm a sucker for yellow, and I like the yellow/gray contrast. However, we're planning on painting the big hallway the same color as the back hallway, which despite being called "relaxed khaki," actually looks kind of green. But I do like the pattern here. I wonder whether it might be better suited to a bedspread than curtains. The simplicity of this one is what I like. Plus, the colors are nice. It may be too "cute." 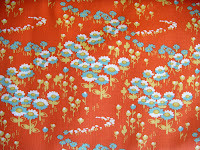 Although I think it would be too cute in a pillow--maybe with yards and yards, it transitions from cute to striking? 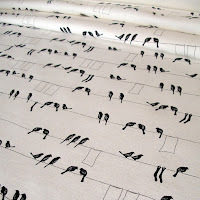 This one is probably my favorite of them all--the birds on laundry lines. Both because I like the way you have to look twice to see that it's actually a specific pattern, and because it kind of looks like piano keys. But is it too small a print for such large drapes? And even more important, is this a cliche? Because I've seen this before in hipster boutiques. I really kind of hate this pattern, but I like the colors. And I'm inexplicably drawn to this one, probably for the master bedroom. I think that color combination is really pretty, and would look nice with dark carpet on the floors if we used it for either the curtains or a spread or a headboard (not all of them at once, of course). This is really surprising to me--you'd think after the Kenny Rogers Roasters situation I've got going on in the dining room, I'd be orange averse forever. Moving forward! I like it! While we're still struggling to finish projects that were started two years ago (ahem, Eric... the deck...), we're making progress on the kitchen. Eric just yesterday finished ripping approximately 8,000 nails out of the dining room subfloor in preparation for plywood and/or cement board and tile. And today he went to put the down payment on our countertops! Soapstone!!!!! 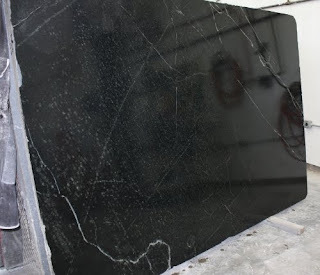 A picture of our stone. We went with a semi-local company, The Stone Studio out of Batesville, IN. www.thestonestudio.com/home Eric has been the point of contact, and these folks have been super helpful and we're both pleased we could support a local business. Plus, the stone is awesome. Eric has also finished the kitchen layout--he's bound to this one, as the stone order was based on it. This is a good thing, because we all know he could spend the next year working on this design. So, top left is facing toward the back of the house, where there's currently that doorway and the window. Not a huge change, except for the fridge and wall oven. Top right faces the south wall, which is currently loaded with three double-hung windows. We're going to remove one entire window, and the lowers on the other two, and this is where we'll have our cabinets and stovetop. Finally, bottom picture is the overhead, and shows the island, where we'll have the sink and dishwasher. A DISHWASHER!!!! It will be glorious to have a dishwasher actually installed and not just sitting in the foyer. It has been so long since I posted on this blog that blogger forgot me and delinked my account. Yikes. It could also have been that I used the wrong email address. Whatever. All is well at #2021. The Harpster is peacefully sleeping through the night (most nights) in her own crib--a relatively recent development that was 1) hard, and 2) necessary. She figured out what was going on pretty quickly, and after just one night of waking up every twenty minutes to yell at us, decided she digs sleeping in her own bed and now wants nothing to do with our pre-bed cuddle time. Which KILLS me because it's my favorite part of the day. Sigh. My baby's growing up. She is talking up a storm, but in a language that only she knows. Very elaborate sounds and words, hand gestures, beseaching look on her face like "why the hell can't you understand what I'm saying," etc., but few recognizable words. Dada is a favorite, both in words and in person, as are "Da!" which means dog, especially when accompanied by a pointing finger at either of the puppies or at a dog on the tv. She has said Yogi clearly several times, but refuses when I ask her to say it. She will not say mama. I know she can, but she won't. Eric is busy at work on our upcoming kitchen remodel--it has been a long time coming. We are finally in the right position to be able to do this, and now that it's here, I'm a little scared. We're moving the kitchen into what was formerly the dining room--a MUCH larger room that opens up into the living room, and should make for the kind of space we've been looking for. Eric just ripped up the wood floors in there, and while we were expecting some of the nails to stick in the subfloor, we thought most of them would come up with the hardwood (likely original to the house, and for the most part unsavageable). That is not what happened. The wood is SO old and so paper thin that every single nail stayed in the subfloor. S, we have a 16x18 room, formerly floored with 2 inch planks, with double nails every six inches. I can't do the math, but that is a crapload of nails to rip up by hand. He's nearly finished after about 10 hours of work. Next up is tile. We're going to do slate in here, and then carry it through to the current kitchen and into the foyer/half bath. Thankfully, the subfloor is in really good shape, so we'll just need to slap down a layer of cement board and tile will go down. Electrician is coming on Friday to install a new panel that will cover the kitchen. Whooo! In the meantime, I am hoping to get over a nasty cold that has left me sounding like, according to my boss, Al Pacino.